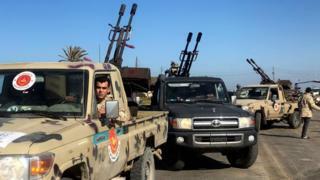 Fresh fighting has flared near the Libyan capital, Tripoli, between pro-government forces and fighters from the east of the country. Reports say clashes between Gen Khalifa Haftar's rebels and pro-government groups are taking place in three suburbs to the south of the city. Mr al-Sarraj said his government had "extended our hands towards peace", but said Gen Haftar will now be met with "nothing but strength and firmness". General Haftar - who was appointed chief of the Libyan National Army (LNA) under an earlier UN-backed administration - ordered his forces to advance on Tripoli on Thursday, as UN Secretary General Antonio Guterres was in the city to discuss the ongoing crisis. The G7 group of major industrial nations has urged all parties "to immediately halt all military activity". The UN Security council has issued a similar call. Speaking in Egypt, Russian foreign minister Sergei Lavrov warned against what he called foreign meddling in Libya, while Egypt's foreign minister Sameh Shoukry said Libya's problems could not be solved by military means.